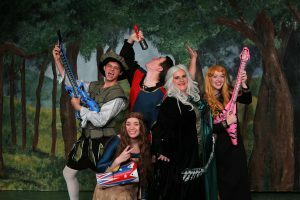 Far left, Adrian Encinas and cast members appear in the rendition of The Brave Knight, Sir Lancelot. Live Theatre Workshop is a local theater organization nestled in the heart of Tucson and comes bearing gifts to the community. Live Theatre Workshop offers five programs: ETCETERA, The Family Theatre program, The Mainstage, LTW’s late-night program and Onstage Education program. The Mainstage produces nine shows each season, while ETCETERA and LTW’S late-night program puts on six shows each season. The Onstage Education program offers four 10-week terms and summer camps. The program covers theater, musical theater, acting and technical classes starting from ages 6 and up. The Family Theatre program does five original musical performances each season for families, schools and community organizations. Performances on the LTW stage for schools and various organizations throughout the season. The Reader’s Theatre program, which is a sub-program offers two to four free staged readings to introduce plays or new plays that are being considered for the upcoming season. All of the programs are commissioned from local writers and musicians and are free to the public, according to the LTW website. For actor Adrian Encinas and Ericka Quintero, current director of LTW’s family series program, the Live Theatre Workshop has given them the opportunity to be themselves in a creative space. Ericka Quintero has been a part of LTW for a few years getting the opportunity to perform, choreography and teach class. Quintero is also the current drama teacher for Salpointe Catholic High School. For Pima student Encinas, theater became a passion in high school early from the push by his former drama teacher Quintero. As soon as Quintero found out she was directing the play “The Brave Knight, Sir Lancelot,” she called Encinas to get him to perform in it. “What I have learned from becoming part of the “The Brave Knight, Sir Lancelot” is the stamina that comes with being a performer, taking care of your body and throat as well as my pride and joy from taking part in this is the customer service aspect and the gratitude of the audience, creating something that they can take home with them is why I like doing what I do,” Encinas said. Live Theatre Workshop’s mission is and will always be to bring theater across the divide to students and individuals who don’t necessarily have the opportunity to reap from these opportunities in their ordinary lives. “We have opportunities for schools/organizations to book field trips with us, and if they can’t get the transportation to come to us, then we travel to them at no extra cost,” said Amanda Gremel, director of the children’s program, via email.